Where can you find Nebraska pharmacy statutes and regulations? 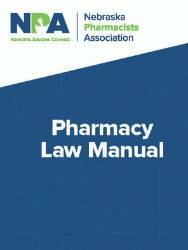 Order the NPA Pharmacy Law Manual and get the statutes and regulations for credentialing, controlled substances, emergency drug box, drug repository programs, mandatory reporting, pharmacy technicians, automated medication systems and so much more! Did you know that every pharmacy must provide access to its pharmacists all reference material appropriate for the accurate, efficient, and safe practice of pharmacy or any specialty practice of pharmacy in the facility? These references must also be up-to-date, in either printed or electronic form, and available at all times while the pharmacist is practicing for that pharmacy. You can find these references by searching online, but why do that when you can order the NPA Pharmacy Law Manual? This manual contains the Nebraska laws and regulations which pertain to the practice of pharmacy. It is organized by topic and indexed to assist you with your law questions. For ease of use, each section contains statutory information followed by the supporting regulations on topics such as pseudoephedrine, fees, technicians, controlled substances, and more.